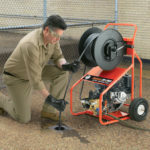 Sure, we all know we need a good quality pipe wrench and a well-made drain cleaner in our repertoire as we head out onto a jobsite. But what about those items we tend to forget that make our lives so much easier? Here are a few key accessories that every plumbing contractor’s toolbox should have. 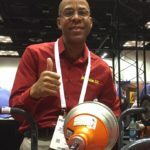 A great tool to have when you don’t have enough swing room to use a full-size tubing cutter, the AutoCut copper tubing cutter can cut copper tubing with less than one inch of clearance and easily handles close stub-out work. It’s also quicker than conventional cutters. Just snap it on the tube, close the gate and turn. The cutter wheel automatically tightens as you turn the AutoCut, with no knobs to twist. 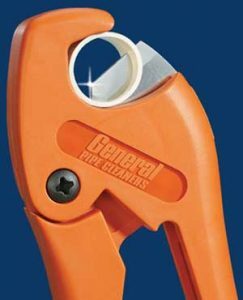 The cutter wheel is spring loaded to provide a constant cutting pressure, so you’ll never accidentally crimp the tubing. For extra leverage in awkward spaces, you can get an accompanying ratchet turning handle that slides over the AutoCut from either side for maximum ease of operation. 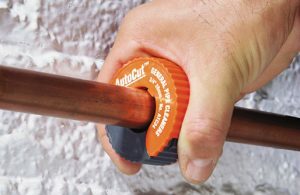 The AutoCut is available in three sizes— 1/2″, 3/4″ and 1. Keep all three in your toolbox, but watch out, they’ll spoil you! Want to quickly and cleanly cut plastic tubing? Get a SuperSlice tool with a patented V-point blade that easily pierces hard or soft plastic tubing to give a clean, easy cut with virtually no deformation. Since the blade is offset, it gives you powerful, penetrating action with minimal force. Use it on PVC, CPVC, irrigation pipe, plastic or rubber garden hose and plastic electric conduit. One squeeze does the job. Ergonomically designed handles give you a sure grip with lots of leverage. With a blade that gives you an edge, the SuperSlice easily cuts tubing as large as one inch in diameter. 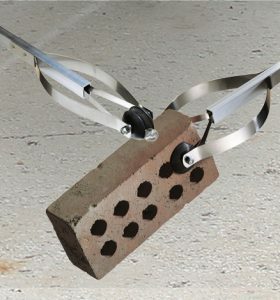 Contractors will find dozens of uses for this unique pick-up tool, like cleaning traps and manholes of rocks and debris, grabbing objects from hard-to-get-at places and changing light bulbs. Constructed of extruded aluminum and stainless steel for durability and corrosion resistance, the EasyReach features two thermal-plastic rubber caps that open 4 1/2″ to grip objects. It’s available in 32″ and 40″ lengths, as well as 60″, 72″, 96″ and 120″ lengths, which fold for more convenient storage. 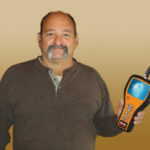 The EasyReach is sensitive enough to pick up small screws and washers, yet strong enough to pick up a five pound rock. Best of all, when you are not using it on the jobsite, you can use it to retrieve golf balls from ponds and pick fruit from trees! It’s unfortunate, but occasionally cables will break, especially after tackling many jobs out in the field. Quick-Fix lets you quickly repair broken drain snakes in the field. The unique Quick-Fix allows you to continue working and finish the job without having to go back to your shop to repair or replace a broken cable. It’s available in 1/2″, 9/16″, 5/8″ and 3/4″ sizes with female or male connectors. 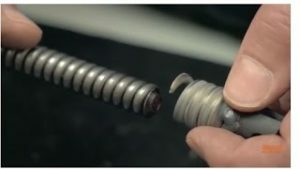 The specially designed spring with a pre-welded female connector is easy to attach in the field. You prepare your broken snake by cutting off the damaged or kinked end of the cable with bolt cutters or a hack saw. Simply thread the Quick-Fix over the broken snake using vice-grips or a pair of pliers (no welding equipment)! Once it’s on, Quick-Fix holds on so tightly that it simply cannot be removed, even if you wanted to. To preserve and protect your sewer cables against rust and corrosion, keep a quart of Snake Oil handy. It’s better than common lubricants because its special rust inhibitor cuts through moisture and replaces it with a rust-resistant coating. You’ll significantly extend the life of your cables, as well as your sewer machine, including the drum, bearings and power cable feed rollers. 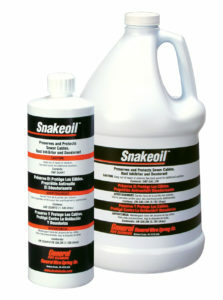 In addition, Snake Oil includes a deodorizer that gives your equipment a fresh, clean smell. While it seems really obvious that the all-important protective eyewear and gloves should be in every contractor’s toolbox, all too many times, they aren’t! Often overlooked or wrongfully deemed unnecessary, safety gear is very essential equipment! Experts suggest that safety glasses should be worn anytime you are doing anything that could potentially damage your eyes. Always wear safety glasses when operating a drain machine to protect your eyes from debris or chemicals that may spray from the drain. And don’t forget to wear them when you are working under a sink, replacing a pipe, soldering or using a power saw. Why risk your eyes for a potential hazard of flying objects or chemicals? Hands can also be exposed to chemicals and other potentially caustic materials while working on plumbing projects and to chemicals, heat or flame when joining pipe. Always wear protective leather gloves over rubber gloves. Cloth or rubber gloves can get caught between spinning coils of cable and take off a finger. Wearing latex gloves under leather gloves helps protect against biohazards in drain lines.